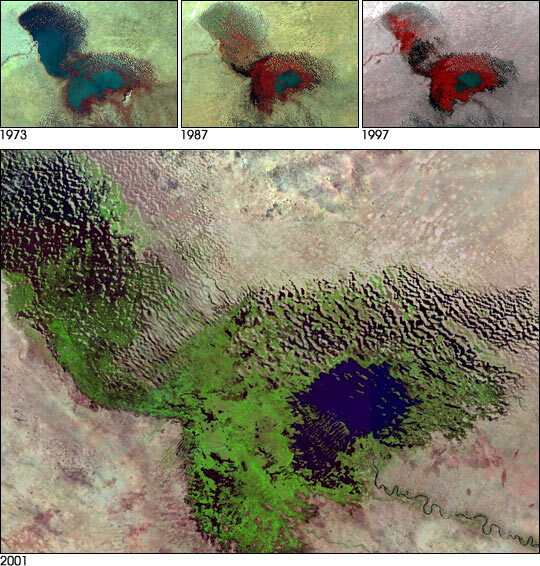 Lake Chad: Then and Now. Image: wikimedia commons. The world’s 37 largest aquifers are shrinking. These waters of life support 2 billion people. Scientists and governments worry about overstress, a condition simply stated: more water goes out than comes in. Unlike aboveground water resources, such as Lake Mead or Lake Chad, whose shrinkage is more discernible, aquifers are difficult to measure. But a recent study by NASA confirms fears. According to Jerad Bales, chief scientist for water of US Geological Survey, issues of land ownership and water rights may be challenged by public need. Utrecht, Netherlands, is the location for the Rikswaterstaat, and also Department of Physical Geography at Utrecht University where Marc Bierkens’ research indicates that 20% of the world’s population is sustained by crops irrigated by groundwater. What can and should we do now, to protect water resources (especially aquifers) for the future? “World’s aquifers draining rapidly,” by Felicity Barringer, June 26, 2015, New York Times. Suggested by Zoe G. Quinn with appreciation. Peru has many treasures, including Machu Picchu, and recently discovered carbon-rich Pastaza-Maranon. Image: wikimedia commons. Pastaza-Maranon basin in Peru may contain the most carbon-rich ecosystem in Amazonia. But regional infrastructure could cause depletion. Peat was also a factor in development of the Netherlands. Should Amazonian peatlands, analyzed by combining optical and remote sensing, become an example of how the world might approach such valuable deposits? The Amazon was a topic for discussion in COP20 in Lima; what will the world decide at COP21 in Paris, December 2015? Frederick C. Draper et al., “The distribution and amount of carbon in the largest peatland complex in Amazonia.” Environmental Research Letters, Volume 9, Number 12. doi:10.1088/1728-9326/9/12/124017.